These Cake Mix Grinch Cookies are so easy and festive they’ll be sure to put you in the holiday mood! That the Grinch’s small heart grew three sizes that day. And the Grinch found the strength of ten Grinches–plus two. Cheerily blowing Who! Who! on his trumpet. Heart to heart,… and hand in hand. These Cake Mix Grinch Cookies are so easy and festive they'll be sure to put you in the holiday mood! 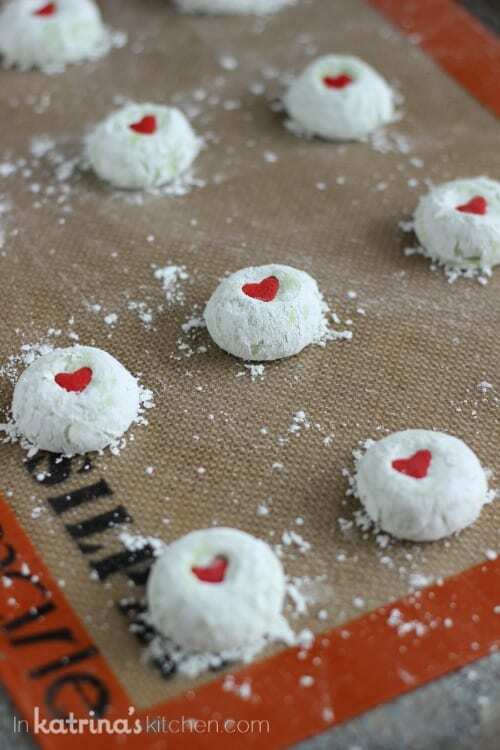 Drop by Tablespoon into confectioners sugar and roll into balls. If the dough is too sticky you can chill it for 10-15 minutes before you roll into balls. Place on baking sheet and press 1 large heart candy/sprinkle. Bake for 8-10 minutes until just set. Let cool 3-4 minutes on pan before removing to cool completely on a wire rack. Having read reader comments, I have tested this recipe using 1/2 Cup oil and with 1/3 Cup oil; results have been similar. I prefer using 1/2 Cup oil so I am keeping the recipe as is. Take the cookies out near the 10 minute mark even if they look like they could use a few more minutes. These are cake mix cookies so they will firm up after cooling on the baking sheet for 3-4 minutes after you take them out of the oven. You don't want these cookies to brown and become crunchy. My son's class had a Grinch party at school and we whipped up these cookies in no time. 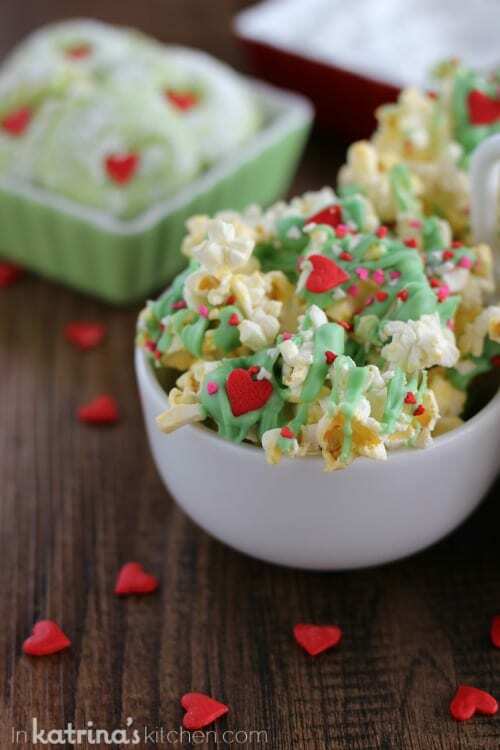 For a Grinchy treat that comes together even more quickly you can pop a bag of popcorn and drizzle it with green chocolate candy melts. Sprinkle it with with heart candy sprinkles and let cool completely before enjoying. These are so cute. I love the Grinch & I try to watch it at least 3 times during the holidays. I found your recipe on Pinterest, where I am a new follower. Thanks for sharing! Where did you find the cute red and green square bowls? Thanks. Need to rush out and buy me a couple of cake mixes so I can start baking! I have to agree with Stephanie…..where did you find those little bowls?? You’re the cutest – I love this post! Awesome cookies 🙂 Merry Christmas!! 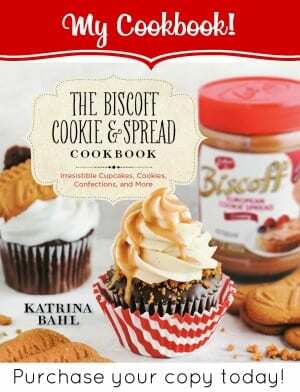 I absolutely LOVE these cookies and this post, Katrina! Such a fantastic idea! I love these!! Completely adorable!! Super cute cookie idea. My kids and I made these tonight and they were delish! These are seriously so adorable 🙂 such a cute idea! It looks delicious..and the color is absolutely perfect! Thank you! I hope you try them! How many cookies does this make? I can’t see the amount anywhere. Mine usually come out at about 3 dozen. 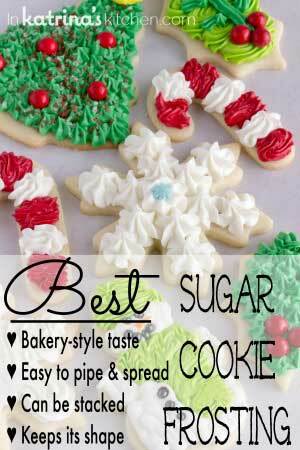 I can’t wait to try these for this years cookie exchange. @Lea Brown, it says that it makes 3 dozen on the right side. Where did you find the heart candy/sprinkle? These are adorable! I got mine at JoAnne’s. You can find them at Michaels or online through Amazon as well. I am going to make these for a baking contest at work. These are so cute, thanks for the recipe! Good luck on the contest at work! These are great! Any tips on how your cookies stayed so fluffy? When mine cooled, they are very flat! Thanks for the recipe.. Love it! Please see the updated notes. I tested 3 batches this week to figure out the mixed reviews. I found chilling the dough balls after rolling them in powdered sugar helps. Thank you for your comments! Look so cute. Can’t wait to make these. Where did you get the cute Grinch serving platters? I got those little bowls at a local craft show. Sorry I don’t have any other info on them! I put the text on myself. This is an adorable idea! 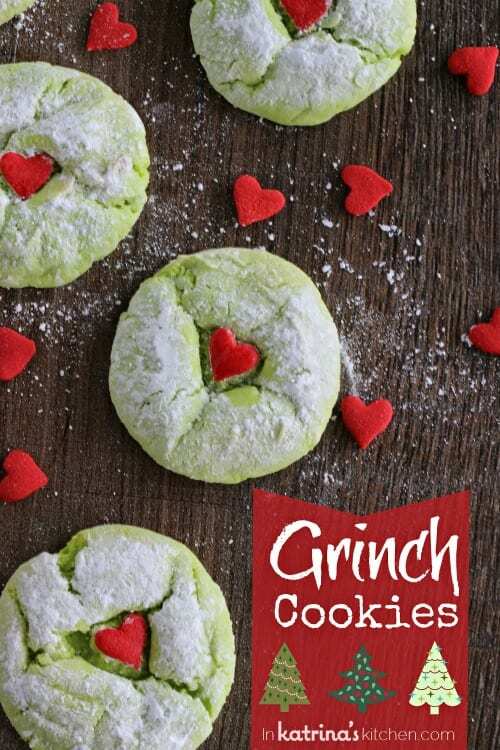 The Grinch is my favorite holiday movie, so I’m going to have to make these soon. Thanks! If I don’t want to use a cakemix, is there any cookie recipe that you would think would taste the same? Making these today with my daughter for our Thanksgiving tomorrow!! Having a big family gathering and she is going to give the cookies out after we eat. We love the Grinch so she is so excited!!!! THANKS FOR THE GREAT RECIPE!!!!!!! I made these with my daughter last week. We couldn’t find the heart sprinkles anywhere locally, so I improvised and used 3 red hots on each cookie to mock the shape of the heart. Once the cookies were baked, my daughter pointed out how the red hots grew into a bigger ‘heart’ shape, much like the Grinch’s heart grew from the beginning of the movie to the end! Aww so cute! Thanks for letting me know. These cookies looking amazing and I am so keen to make them!! I used 16.5 oz. Thank you for writing. These are awesome. Love them! These are adorable! I decided to make them on a whim in December so obviously didn’t have any heart sprinkles on hand, nor did any of the local stores I checked. So instead I got some red chocolate melting disks and melted them in a squirt bottle. I then piped out some chocolate hearts freehand onto wax paper. I didn’t put them in the cookies before cooking but made a small indent with my finger and added the chocolate heart when the cookie was almost cool. Where did you find the hearts? I can only seem to find small white/pink ones. I want the bigger red hearts! I am planning on making these for my daughter’s birthday party at school. Her bday is Dec 20th, but with other Dec bdays and the class Christmas party on the 19th (the last day before Christmas break) her party got moved back to the 17th this year. I think I need to enlist the help of friends. We live in a smaller community. I’m sure I would have better luck in the city! Patti – I might have to try that! Thanks!! Where did you find those perfect heart shapes?! I want to make these but I’m not sure what to use for the hearts. You can find them at most craft/baking stores or online. Mine were flat too – although I kind of squished the balls down before they baked – maybe that was it? Also, I found that I had to watch them *really* close – leave them in 30 seconds too long and all the green baked right out, especially on darker cookie sheets. I made two batches, so had lots of experimental opportunities! “There goes my grinch side” lol that made me laugh 🙂 Thank you for taking the time to comment! My husband and 9 year old son LOVED these! Although they did come out really flat too! I am going to try this again in hopes to solve the problem. In the pictures they look so plump and fluffy! The only thing I can think of, is the dough should maybe chill a little longer? Either that, or I shouldn’t have doubled the batch… I also couldn’t find “French Vanilla” cake mix, so I just used a basic yellow/vanilla one. Any suggestions, anyone? I made these today, and they turned out very cute! I just piped red hearts on with some decorators gel. Mine got really flat too though, not sure why? I also added a teaspoon of peppermint flavoring just to give them a little more jazz. Pretty tasty! Great idea! Please see the updated notes. I tested 3 batches this week to figure out the mixed reviews. I found chilling the dough balls after rolling them in powdered sugar helps. Thank you for your comments! Mine turned out very flat once cool. I am going to try to make them like the lemon crinkle recipe but use vanilla cake mix and add green. These I have made before and they do not turn out flat. PLEASE! What is your secret to the fluffy cookie? Mine turned out flat and it looks like others have as well. Maybe you can share the brand of cake mix you used? Thanks! These looked so fun and what a great dessert for a holiday party. Gotta say, i followed the recipe exactly and they tasted terrible and looked nothing like this, any suggestions if i try this again? Sorry that you didn’t enjoy them! Thanks for a great recipe! I made these for my husband to take to his class a couple days ago (a university class!). I used a plain white cake mix with pudding in the mix and then panicked as I’ve never made cake mix cookies before. Would the pudding cause a problem? I Googled it and several recipes said that 2-3 TBS of water was necessary for cake mix cookies. So I compromised and worked in 1 TBS after the dough had already chilled for 20 minutes. Put the mix back in the fridge for another half hour and the cookies baked up fine. They were a little too sweet for my personal tastes at first, but I found the flavor mellowed after a couple of days. Just so cute! Hmm I did 3 test batches this week but didn’t use a pudding mix. Found these on pinterest and Im making them tonight for my sons bake sale at the school winter party tomorrow. I already had the same heart sprinkles from Valentines so that worked out perfect. I found the French Vanilla cake mix at Kroger (Betty Crocker.. super moist mix) Double the recipe and followed to a T. They look amazing, just like the picture! Thanks so much for sharing, I know the kids are gonna love them! Are you sure you didn’t mean 1/3 cup oil? I followed yoire recipe and they spread too much and too thin. Mine were so sticky it was almost impossible to roll into a ball. I had to add a ton of powdered sugar to the mix just to be able to roll them. Not sure what I did wrong? They did end up really flat too like others commented. So, I used Duncan hines 16.5oz box French vanilla mix and altered it by using only 1/3 cup oil. I used 6 liquid drops of food coloring whereas author used gel food coloring which is much more concentrated hence only 1 drop.My large heart sprinkles were from party city. I followed the remainder of the recipe. Very soft light fluffy cookies. Delicious! They seemed like such a cute, easy idea… the batter is so thick and sticky that it just broke my electric mixer. And they dont turn out at all like the picture. Not worth the headache! Cookie dough is chilling now. I’m making these Grinch cookies for cookie exchange at work. I made the Grinch kabobs too and they turned out so adorable. Thank you for the recipe! These are SO cute. I found the hearts at Williams Sonoma (they are a little pricey but the only place I could find them locally right away). One question … my cookies turned out flatter than yours pictured. They looked puffier right after coming out of the oven but then deflated somewhat. What the??? They still look cute, just not AS cute. Any idea what the problem might have been? We are trying these this year for Christmas!! Unfortunately we can’t keep the cookies raised, they keep falling flat and don’t look as fluffy as yours. Any suggestions? These look so cute! I can’t wait to try them. To those with the flat cookie problem: I haven’t made these yet, but as a general rule, if you chill cookie dough for at LEAST 2 hours (overnight is better), it maintains its shape better when baking. This applies to the vast majority of cookie recipes. Hope that helps! I will post again once I try these babies out. My daughter has been obsessed with the Grinch this year! Thanks for your comments. I hope your daughter loves them! 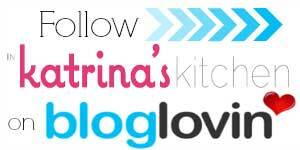 Feel free to tag @KatrinasKitchen on Instagram if you snap a pic. I made them with butter Crisco instead of Veg. oil. and they turned out much better . I have them baking in the oven right now. I followed the recipe as stated above and mine are fluffy. I also had no problem with having them oily. I don’t know if it was because I hand mixed them first and then used the hand mixer or because I just lucked out.. I’m thinking maybe I might use a lemon or lime cake mix next time as they cookies look like they should be lemon/lime. I found the the red sprinkle hearts at Michael’s….the bottle comes with red/pink hearts mixed. Thanks for letting us know! And yes that’s the same pack of sprinkles I found. So I just finished baking these amazingly adorable and not to mention delicious cookies! They came out just like the picture!! I used 1/3 cup of oil and chilled my dough overnight. I also left them in the oven for 9 minutes. I only let them cool for a minute on the pan and then removed them immediately. I found leaving them too long on the pan flattened them. 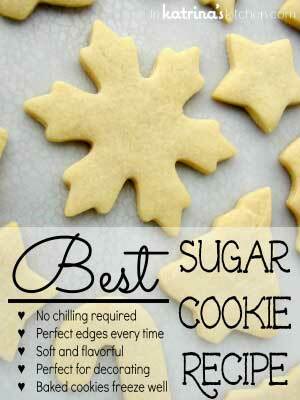 These are so cute and are sure to be a hit at my Christmas cookie exchange tonight. Oh and I ordered the heart sprinkles from Amazon (prime). I wish I could post my picture of them!! 🙂 Merry Christmas Who-ville! I would love to see! Feel free to post on Facebook or Instagram and tag me. Thanks! Next time maybe one more drop. These are super cute and I love the Grinch so of course I had to try them. I would alter the recipe to make them taste better. My kids love Pilsbury Fufetti cookies and you use 1 stick of butter and one egg. Or check a box of Funfetti cake mix and see the directions on converting it into cookies. I would think the same directions would work on any flavor of cake mix. Thanks for the cute idea! Found the key to the Grinch Cookies ! After reading the posts about the cookies coming out flat I experimented and they came out wonderful !! I went between the oil amounts and added a bit more than 1/3 cup and not a half cup, then I added a 1/2 teaspoon of baking power to the cookie mix to pump up the “puff”. Perfect !!! and adorable cookies !!! Thank you for this wonderful recipe !!! A keeper for sure !! 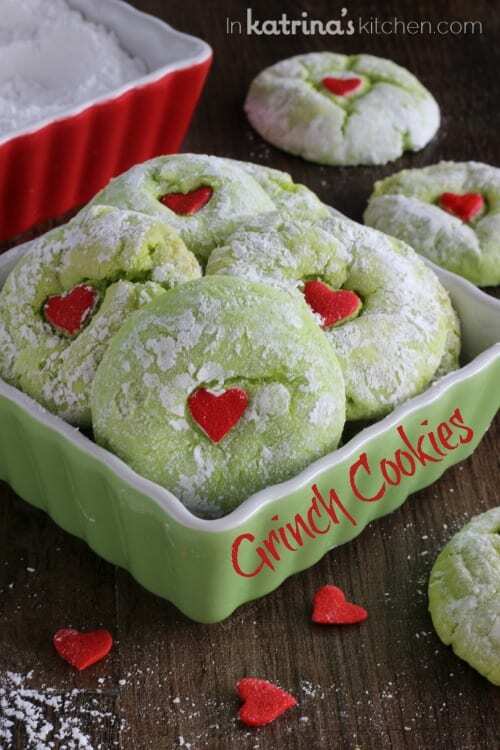 Where did you get that adorable Grinch cookie serving tray?…….I’ve got to have one!!! So cute. Love the little red heart nose! fanulous making these and I think I might add pistachio flavored instant pudding for flavor! I realize you tested several batches about oil and cookies not setting up, etc. I tried these tonight, but cut the recipe in half because I’m just testing the recipe myself because I wanted to make them for my nieces and nephews for Christmas. I realized later though that I cut everything in half EXCEPT the cake. They turned out perfect though!!! Thanks for the recipe, these will be a huge hit! If you don’t want to pay to buy the heart candies, simply make some Royal icing using (egg whites and powdered sugar) and dye it red. Pipe the hearts on a sheet tray and let them dry. Then use them in place of the stire bought candy hearts. You can flavor Royal icing, too. Can this dough be frozen ahead of time? These were awesome, easy, and delicious and took no time to make. Your recipe was spot on! Love this idea will try I’m sure we will enjoy. You can’t even roll them! Is it missing flour? Help!!!! These are adorable. 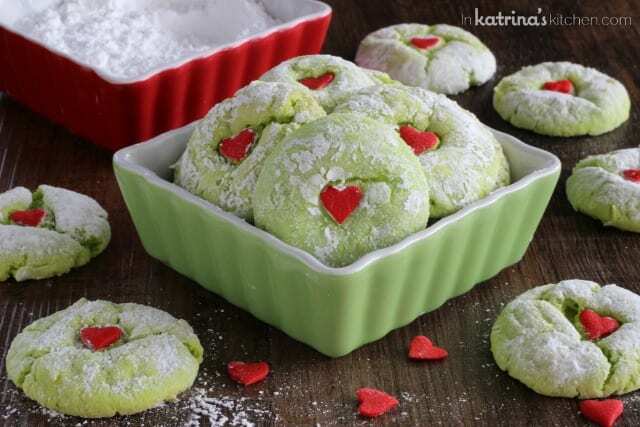 I would love to make these with a pistachio flavor, do you have any suggestions for how I could do that? Thanks! Mine are almost ready to go into the oven. Glad I read all of the reviews to am going to place back in the fridge for a bit. I found the Hearts at Amazon and because of Prime free shipping. I will let you know how mine turn out. Thanks so much! I may have made mine a bit too big, however, I did need to cook them twice as long as recommended. They were a bit done but I don’t think I could have eaten them if they were cooked less. I also had to use at least 3 or 4 drops of food coloring. I think that the crinkle cookies (made like traditional cookies) may work just as well and would be a true cookie flavor/texture. They would look very similar – maybe even a bit more cracked just add the green food coloring and heart. I looked everywhere for the heart shaped candies, could not find. Used red hots instead. Very messy to make and the taste was just okay. Not worth the mess they make. Sorry just being honest. These turned out so cute! Everyone loved them! What kind of food coloring did you use? I had to use a lot more than one drop. I can’t wait to try these. Curious if you have ever used the yellow cake mix instead of the french vanilla? I have so many boxes in my house of Yellow. Wondering if it will still work? Hello, I made these last night for a cookie party I am going to this evening and they tasted delicious but I’m concerned I might have undercooked them. the cookie I tried was soft in texture. Is this how they are suppose to be? I really don’t want to anyone sick. :/ Please help! Just made them!! Did the fridge thing 2 times with each batch. Turned out perfect — side note 8 min was NOT enough. Cooked at least 13!! I just made these and I only got 2 dozen cookies. Maybe I made them too big? I also got burning on the bottom of them. I am going to try them again in a few days and add more food coloring and powdered sugar and less veg. oil. they did seem undercooked at eight minutes, but since the bottoms were burning I took them out. Any suggestion on this? Thank you! the cookies are super cute and my kids love them ! So, Grinch thought he might like some of these yummy cookies. I bought all the ingredients and put the recipe together with NO issue! Came out fantastic! Grinch’s heart, indeed, grew 3 sizes !. I would note the following: This Momma elf looked high and low and below and could not find these hearts…finally! yes, but what did my eyes find but a mixed red/pink jar at the Party Store !! the cookies were on ! I also discovered my cake mix was only 15.25 oz (and had pudding) -so I used the 1/3 C oil (thanks for the suggestion)…chilled dough while I was working on them Made them in 1″ balls. Nicely done…Grinch was happy, Momma Elf is happy !!! These were a hit with my family and friends but I used a lemon cake mix and it totally beats vanilla. Just had to share!! 1. My cake mixes had pudding in the mix. I had to cook for about a minute longer is all but followed everything the same. 2. Chilled while the oven was preheating (and maybe a little extra). 3. I could not find heart shaped sprinkles so I used molding candy, melted it down and used a heart cut out. It was a pain but for the grinch cookies, it made it worth it. 5. I can get about 2 dozen is all but cake mix is a $1 on sale so it’s the cheapest, fastest, easiest cookie so making two boxes is no big deal. I loved this recipe I took the concerns about the cookies being flat and added a small pack of vanilla pudding and made 4 batches they were never flat and they turned out great every time!! Thanks for the great recipe!! 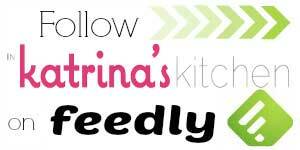 I love this recipe Katrina! I have to share that I’ve tried this multiple times, cutting the oil, adding baking powder, chilling the batch overnight, etc. and they were flattening each time. However, I received a countertop convection oven for Xmas (I opened it early), tried this recipe again (on a whim) and they turned out PERFECTLY! It’s the convection oven that made all the difference for me. Wonderful recipe. Thanks a lot for sharing this. I will certainly try it and post the feedback here. 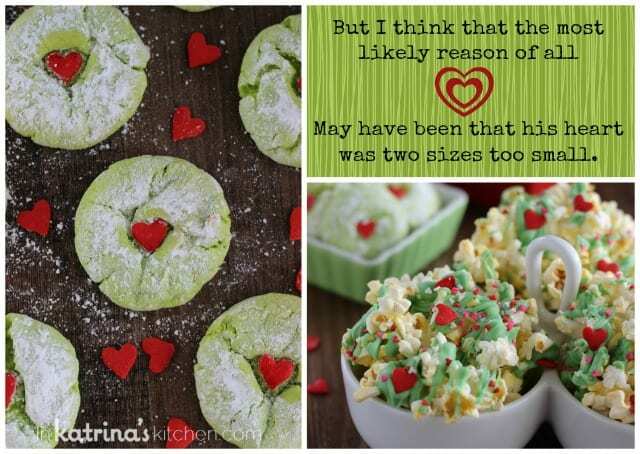 I would love the recipe for the Grinch popcorn treat that is shown in one of the photos. Am I missing it on your website? Thanks! Is there a link to the Grinch Popcorn recipe? Thanks! I just drizzled melted chocolate over the popcorn and added tiny heart sprinkles. Thanks! Hello so I live in Houston, Texas and I am baking them now but I am well beyond the 8 minute mark I am guessing because of the difference in altitude can you give me your location so I can know the difference. Thank you! So if i change the color to red and a white hear can it be a santa cookie? Hi! Loved this cookies. I love how fluffy they are. I made this cookies for my family they really liked them except that they thought there were too sweet. Is there any way that I can make them a little less sweet if so can you please help me. I will love to make it for them again. Thank you..
Any recommendations for storage? Air tight container? I just made them today and need to keep them tasty until Christmas! Hey Katrina! I’ve been looking through a lot of your recipes lately and I wanted to tell you how much I love this idea! I make Cake Mix cookies regularly, but I tend to cut the oil down to 1/3 cup, but I add an extra egg and a single packet of instant pudding mix. It makes the cookies much more dense and flavorful. Then, I chill the dough thoroughly before baking, so my cookies stay puffy! Just sharing my tricks in case anyone wants to try them! I love the Grinch theme and I think I might do a lot of them this year! Made these exactly as written and they came out perfectly fluffy at exactly 10 min (with 3 min cooling on the sheet). They are so cute and delicious! I’m giving them out as party favors for my son’s Grinch-themed birthday party. Thanks for the recipe! Do the grinch cookies freeze well? Love these cookies, went exactly by the recipe, turned out perfect. Will be a Christmas cookie every year. Thank you for sharing. Like EVERYONE else…considering my cake mix included “pudding in the mix” I did 1/3 cup oil maybe …a table spoon more and 2 tablespoons of water. Refrigerated for 2 hours, not sticky…didnt “spread out” Turned out perfect!! I wish I had scrolled down farther to buy the Wilson heart candies. I bought cinnamon red hearts but they didn’t have a definitive heart shape. I also bought vanilla cake mix and found the flavor lacking. So go for the french vanilla cake mix for sure. I loved this great recipe. I added crushed candy canes and sprinkled those on top because I wanted a little mint flavor since i didn’t have peppermint extract. The candy canes didn’t add much and may have taken away from the vanilla flavor. Next time i’m going to try to add peppermint extract for a little more flavor. This was a great idea! I also found that I needed to refrigerate the dough about 15 minutes before forming into balls which you suggested. The cookies were fluffy and adorable! I’m starting a new holiday tradition of watching the Grinch and then making the cookies. Thanks for sharing!